Here's a sweet listing by a Minnesota based private seller with good Feedback ratings. The guitar is claimed to be a One-Off. Features include AAAA flame neck with a "D" profile. No other specs given other than it's a "Dream Factory era" John Page build. The back headstock stamp is a V style USA Custom Shop logo. I verified from a few reputable archives images of '94 Page Strats that the V logo is legit for that year. Not much earlier, the headstock logos were the oval type with no V.
Run the ser# CN401497/config description with Fender Consumer Relations at 1 (800) 856-9801. 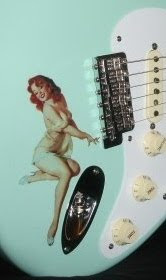 Otherwise, this is a rare & special Strat!